Photo: Long Island Wins. Creative Commons BY. Hoping to provide him a better future, 12-year-old Jose Antonio Vargas’s mother sent him from the Philippines to live with his grandparents in the United States. However, she did this without obtaining authorization for him to stay in the country permanently. Vargas did not know of his status until he was 16 and learning this fact had a big impact on the young man. In 2011, by then a Pulitzer Prize-winning journalist, he publicly revealed himself as an undocumented immigrant in the New York Times Magazine to raise public dialogue about immigration issues. Just a few years later, Vargas has gone on to tell his story in a film called Documented, which made its European Premier at a recent conference on Statelessness held at the United Nations University Institute on Globalization, Culture and Mobility (UNU-GCM). Chronicling his journey to America from the Philippines, his public struggle as an immigration reform activist/provocateur, and his experience of reconnecting with the mother he hadn’t seen in 20 years, the film raises interesting questions regarding undocumented child migration. Mainly, it is an examination of what can happen to those who unknowingly cross borders without the proper documentation. This film illustrates how, although the question of deportation looms over the heads of these undocumented youth, legal ways of gaining documentation are absent in many receiving countries. Children, regardless of documentation status, possess rights through an international legal framework. Firstly, through the 1990 UN Convention on the Rights of a Child (CRC). According to the United Nations Children’s Fund (UNICEF) the CRC is signed and ratified by all the countries in the world except two: Somalia (because it has no recognized government, making it unable to do so) and the United States. Specific provisions of the CRC give a child the right to an education, housing and health care (Annex A). One critical aspect of the CRC is that when dealing with a child, “…. the best interest of the child shall be a primary consideration” (Article 3.1). In Article 7.1, the CRC sets out a right to birth registration that is not dependent on the status of the parents. Another possibility exists for why a child can be undocumented. The CRC sets out the right of the child to be registered at birth. This birth registration gives a child a nationality and protection from the state. It also provides the right to education and healthcare. However, instances exist where birth registration does not take place. This can be for a variety of reasons one of which is the fear of having a lack of documentation be detected. Here, parents fear that the interaction with the local municipality (where birth registration can take place) will lead to detection and therefore deportation. For example, in the Netherlands, although the right to a birth registration for undocumented migrants is provided, it is to be done at the local municipality, causing fear to parents who do not want to register the child as to not draw unwanted attention onto themselves from the local municipality. Other reasons for the lack of registering a birth can stem from the inability to provide documents or from the fact that the parents of the child are not married. For example, in Romania, the registry requires the marriage certificate as well as the identity documents of both the mother and the father. This usually makes it impossible for undocumented parents. During his reelection campaign, President Obama vowed to take action on immigration policy. 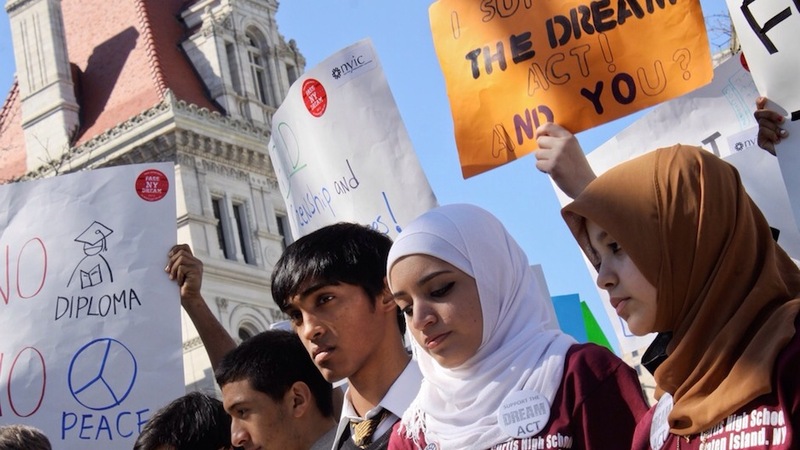 In 2012, the Obama Administration introduced the Deferred Action for Childhood Arrivals (DACA) policy which allowed young, undocumented migrants to pursue a work permit along with a two-year postponement of deportation. Eligibility depends on criteria that include: arrival to the US before the age of 16, having been under the age of 31 as of 15 June 2012, and currently attending a school or having already obtained a high school degree or its equivalent. At the time of of its enactment, DACA was eligible to help 1.9 million undocumented migrants out of the estimated 11 million undocumented migrants living in the US. DACA was bittersweet in that while it was a first step, many undocumented migrants, like Vargas, missed the age cut-off limit by a few months. In July 2014, issues with US immigration policy continued when a US plane deported 21 children aged between 18 months and 15 years (along with many adults) to San Pedro Sula, Honduras, a city currently experiencing difficulties with drug trafficking and violence, which would be in violation of CRC Article 3.1. Shortly thereafter, the leaders involved in this issue — Barack Obama of the US, Otto Perez Molina of Guatemala, Juan Orlando Hernandez of Honduras and Salvador Sanchez Ceren of El Salvador — agreed to work to try to curtail the number of children taking dangerous journeys to cross the US border. One proposal was creating a program in which children seeking refugee status are able to file a request in their home countries, instead of filing from the US after long and risky travel. While this is hopeful for lessening the number of people making such a journey, it did nothing to address the struggle of those without documents who are already residing in the United States. In November 2014, Obama took action to address the undocumented population in the US. His Executive Order regarding immigration policy enacted significant changes to DACA. By dropping the previous age limit, up to 4.4 million undocumented parents and children would be eligible to stay and become documented migrants. This new policy was met with strong criticism by the opposition party, which plans on limiting its effectiveness or dropping it altogether when taking control of the US Congress in January. In Europe in recent years legislation has made undocumented children vulnerable. According to Thomas Hammarberg, a Swedish Diplomat and a former Council of Europe Commissioner for Human Rights, the young who have fled persecution or run away from poverty suffer exploitation and abuse once they reach Europe. For example, in 2013 in Denmark, immigration detention was reported to be prolonged by up to one year in some cases. This included the detention of children and those who were victims of human trafficking. Hammarberg stated that authorities frequently do not decide in the best interests of the child, as the CRC requires. In terms of education, Article 28 of the CRC guarantees the equal opportunity for children to attend school, regardless of the child’s legal status. In France and Italy, access to education for all children is provided by their respective constitutions. However, cases exist where undocumented children are targeted in a different manner. In Italy, 2009 legislation (Legge n.94/2009) encouraged tallies to be kept of undocumented children. Earlier, in 2006 in France, police were sent to monitor the families of undocumented children. Thus, out of fear, many undocumented migrants not want to risk this, rendering access to education unequal and therefore resulting in effective non-compliance with the CRC. Undocumented children each have a story. Some take a trip alone, some for economic reasons, some to escape danger. Those who continue to make the dangerous journey to Europe and the United States can face hardships when arriving — whether it be prolonged jail times or deportation. Even if they are lucky enough to have entered and attempt to start a new life, like Vargas, their worries are not over. Others are not registered at birth, leaving them to grow up undocumented. These children make their lives in countries they may come to view as “home” only to realize at a later date that they do not have the proper documents. In these cases, they meet a dead-end and are left fearing deportation with no access to a process to gain the documentation needed. In many cases, undocumented children do not make the choice to break immigration laws, as is the case of Jose Antonio Vargas. Family can make the choice for them in order for them to live a better life or escape danger. For this, states should abide by the CRC and truly put the child’s best interest at the forefront when making decisions regarding undocumented migration. Undocumented Children: The Dangerous Journey and Unknown Future by Zaid Clor is licensed under a Creative Commons Attribution-NonCommercial-ShareAlike 4.0 International License. Zaid Clor is currently doing an internship at the United Nations University Institute on Globalization, Culture and Mobility (UNU-GCM) in Barcelona (member of the UNU Migration Network). He is also a Master’s student at the Institut Barcelona d’Etudis Internacionals where he is obtaining a degree in international relations.